Enjoy 50% Cashback up to Rs. 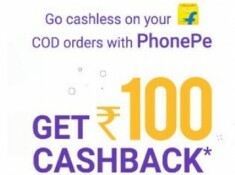 100 on Flipkart shopping when you payments via PhonePe (UPI, Cards) during the offer period, on first Flipkart Cash On Delivery (COD) shipment (per user) delivered by Ekart Logistics. 50% cashback upto a maximum of ₹ 100. Cashback will be credited to the PhonePe wallet within 24 hours of successful completion of the transaction. Offer is currently Valid only in New Delhi, Chennai, Bangalore, Hyderabad, Kolkata, Mumbai, Pune, Gurgaon, Lucknow, Ahmedabad and Chandigarh.